John, Robert (Bob), and Tom at Haw Paw Villa one very warm Sunday afternoon. the winding on of the film. (Right) Tom and Bob with Sati, the Amah, in the garden at Meteor Road Tengah. 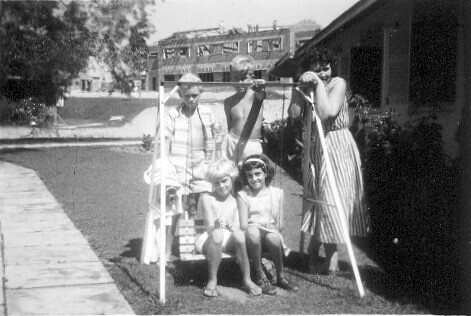 My good friend Raymond Clayton, myself in the middle with no shirt on, Ray's mother and his sister and her friend Carol Strutt seated on the swing. In the background you can see new houses being built on Hunters Hill. The photo was taken just after Ray's family had got back from holiday in Hong Kong on the Nevassa; the ship my family should have been returning to the UK on. This was about two weeks before we left Singapore flying home on a Brittania. Mum wins the fancy dress competition dressed as a Chinese itinerant hawker. The trousers and blouse were borrowed from the Amah and she used one of her own sewing baskets and borrowed one from a friend and strapped them to a broom handle. Because of the hat she couldn't see what was going on and wasn't aware that she had won. The time we spent in Singapore was of course during the Malayan Emergency (a war against communism by any other name). Malay members of the Singapore Regiment were amongst the people that my father worked with during that time.